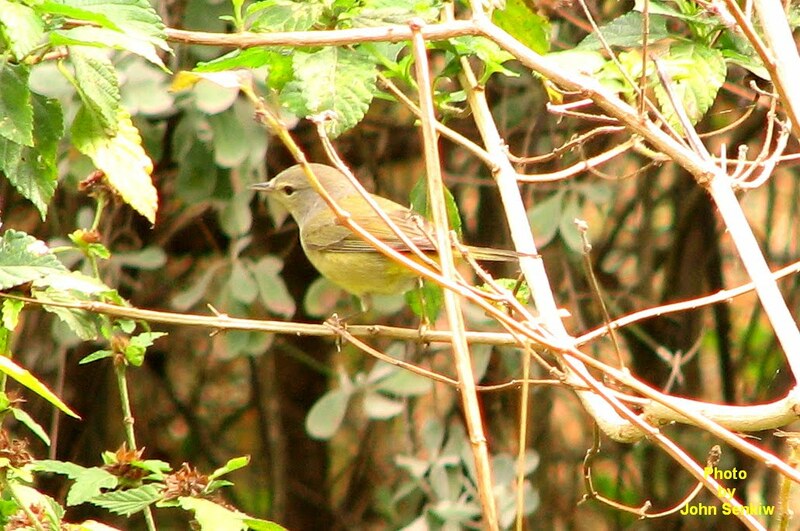 Autumn is a good time to watch warblers, particularly juveniles. As mentioned in the last article , it is also the time of year when it is very difficult to positively identify them. In many cases colours alone are not enough and behaviour and/or a process of elimination has to be used. First one has to determine whether the bird being observed is a finch, grosbeak, sparrow, flycatcher, warbler and so on. Once this is determined then identification is easier but not necessarily easy. This week's featured bird, the Orange Crowned Warbler, is a case in point. When it comes to a bird with the fewest field marks, this one takes the prize. The whole top side from the beak to the tail tip is a dull yellowish olive grey; the underside is much the same but a little paler. There may be a faint eye stripe and possibly even fainter wing bars. When observing a bird in the outdoors with the presence of light and shadow these field marks are all but useless. With binoculars in good light, the faint breast stripes and yellow under tail coverts are noticeable and useful in identification. Overall, with this bird drab is in. As its name implies, it does have an extensive orange patch on its fore head. The problem is that the patch is almost never visible even on a windy day. Several years ago I saw one in Texas taking a bath. When its feathers got wet the orange patch was clearly visible. I took pictures of this warbler before and during its bath, but only the first pictures turned out. One of these photos is used in this piece. The shots that showed its orange fore head were of such poor quality that I could not use any of them. Another fall warbler that is very similar to the Orange Crowned is the Tennessee Warbler. (See article No. 15). There are two differences but they do not really stand out and binoculars are almost mandatory. First, the Tennessee has a faint whitish eyebrow stripe that is always present; the Orange Crowned does not. Second, the Tennessee has white under tail coverts; the Orange Crowned has yellow ones. One ornithologist stated that in identifying the Orange Crowned Warbler ask yourself, "why is it not an Orange Crowned Warbler?" In other words once all other birds have been eliminated what is left must be the Orange Crowned. This morning, Sept. 8, there were three Orange Crowned Warblers picking insects off our Chokecherry trees. One warbler was actually taking a bath by flitting among the wet leaves then fluffing out its feathers and fluttering its wings in the same way birds do at a bird bath. This is the first time that I ever witnessed such an event. Even in full living colour Orange Crowns are very drab and hard to identify; in black and white pictures it is even worse. Have fun with this one.